Oh, how we love gnocchi, so tasty and Italian. Fructuoso has sent in this salad with a taste of Italy. This is the best way to approach the boot-shaped country and enjoy its food from a distance. This salad has it all. The Italian touch and Serrats mussels and white tuna. What more could you need? Apparently nothing. 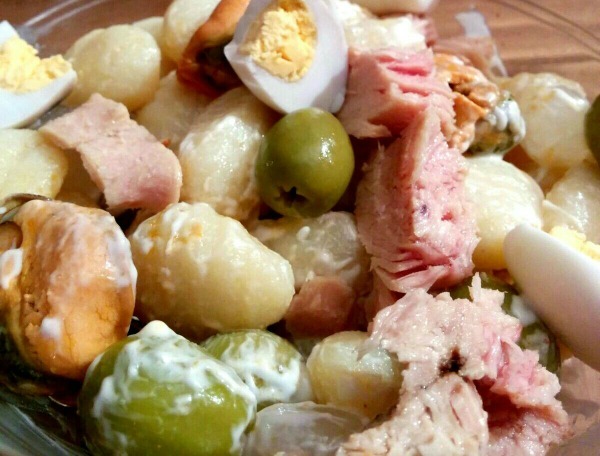 Put the gnocchi, the rinsed mussels, the white tuna and the boiled and chopped eggs in a bowl. Add the olives and dress with some mayonnaise, oil, salt and vinegar.